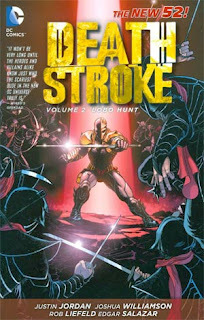 If you want to read a book with a lot of Deathstroke in it, one of those books is Deathstoke Vol. 2: Lobo Hunt. That's faint praise, but I don't think anyone is going into a book that starts off with four issues about Deathstroke and Lobo written and drawn by 1990s superstar Rob Liefeld and expecting to find Art Spiegelman. This not by far the worst New 52 collection I've read, nor do writers Liefeld, Joshua Williamson, and Justin Jordan do particularly badly by Deathstroke Slade Wilson, but this is certainly a collection of stories with a heavier emphasis on action than character or even plot intrigue. And yet, while I enjoyed some parts of this trade a little more and some a little less, I was ultimately surprised at how underwhelmed I was by the whole thing. I had really been hoping for some "out there" mania, but all in all this book is relatively tame. Indeed Rob Liefeld writes and draws the first four issues of this book, the "Lobo Hunt" storyline. To comment on the excesses of Liefeld's style -- the clenched teeth, the lack of backgrounds, the tortured anatomy (including one unbelievable Zealot in issue #12, the fourth chapter) -- would be reductive; this is a writer/artist doing the thing that he does. As a matter of fact, there's a certain joy in seeing Liefeld draw a '90s character like Zealot again; five years ago, would you have wagered you'd ever see Rob Liefeld draw Zealot in a DC comic again? If anything, one of my qualms is that Liefeld too egregiously tones down his art style here. The costumes for the Omegas (a weird approximation of DC's Omega Men), their alien foes, Lobo, even Deathstroke in the beginning are all very slimmed down, tight-fitting suits. There's barely a giant gun nor large pouch, not even for Lobo, and this lack of excess made Liefeld's pages seem not refined, but unsatisfyingly sparse. In that same vein, another disappointment is that -- after two issues where Deathstroke fights insignificant bad guys who are not Lobo -- Liefeld's actual presentation of Lobo is remarkably mild. There's a "frag" here and there, but never a "feetle's gizz," and by and large Deathstroke versus Lobo is just a bunch of punching and kicking. Perhaps this Lobo is meant to reflect his earlier LEGION appearances and not the later Alan Grant series, but I left this section not really feeling like I'd gotten my "Lobo fix." Kyle Higgins's Deathstroke volume that preceded this one essentially demonstrated how Wilson was "the best" against increasingly outrageous opponents. One thing I noticed and disliked in Liefeld, Williamson, and Jordan's stories is that Deathstroke gets knocked around quite a lot here. Liefeld starts the book re-orienting Wilson as a man with a death wish mourning his wife Adeline, and the whole book never quite escapes that "woe is me" trajectory. Obviously a book where Deathstroke can defeat everyone wouldn't offer much suspense, but Lobo knocks Wilson around, followed by (a villain actually named) Deadborn, the unkillable dictator Korschi, cybernetic gangster Tomo, and Wildstorm's Majestic. As opposed to in Higgins's book, I never truly felt Deathstroke posited as "the best" here. After the Zero Month issue (which interestingly hews close to Deathstroke's pre-Flashpoint origins), Liefeld and Williamson collaborate on the aforementioned issue where Deathstroke fights Deadborn, and then the "Hawkman: Wanted" crossover with Savage Hawkman. The Deadborn issue generally connects to a thread in the book where Wilson's not-dead wife Adeline and son Jericho plot to kill him, but later Jordan takes the story in a different direction such that Deadborn becomes an afterthought, and said issue "just" a long fight scene. Deadborn, who actually calls himself "the dreaded Deadborn," is the most 1990s-esque part of the book; it's the book's lowest point on one hand, and on the other it's kind of sad Liefeld didn't draw that issue, too. I give a thumbs up to the "Hawkman: Wanted" issue because it does actually explain in a reasonable manner how Deathstroke can be walking around with Thangarian Nth metal armor. In fact, despite stretching between three books of low quality (Green Arrow: Harrow being the third), the "Hawkman: Wanted" crossover turned out pretty well in terms of how you think a Hawkman/Green Arrow/Deathstroke crossover spearheaded by Rob Liefeld might. Justin Jordan writes six issues, encompassing three two-issue stories. I have mixed feelings about the first two, one in which Deathstroke helps lead a revolution against immortal dictator Korschi and the other where Deathstroke is involved in a Japanese gang feud. These are self-contained stories, "just" Deathstroke stories with no real tie to anything, and as such it's hard to see their relevance. At the same time, I generally recall the Marv Wolfman series being the same -- spy story after spy story -- so maybe there's some precedence here. Jordan and artist Edgar Salazar do choreograph an impressive fight scene in issue #18, the eleventh chapter, with Deathstroke and Toro hanging off the side of a building. Aside from "Lobo Hunt," Jordan's last two issues in the book are probably the real meat of the story, following from storylines in both Team 7 and Ravagers (both also cancelled) in which Deathstroke encounters Adeline, daughter Rose (nee Ravager), sons Grant and Jericho, Terra, his old Team 7 teammate Lynch, and the New 52 Majestic. A story with this much family Wilson might be notable, but while I appreciate Jordan using Team 7 and Majestic, the story has a lot of trite dialogue and a "bad Jericho" who, as in pre-Flashpoint, is more annoying than an effective villain. Jordan also flubs a bit of Liefeld's continuity when Deathstroke seems not at all surprised to see Adeline alive, which makes the beginning a tad confusing. Also, as much as I like that Jordan uses Majestic instead of leaving the character in limbo, I'd continue to prefer to see the Wildstorm alien prince version to this berserker solider-turned-metahuman. All in all when you follow the connections from this book -- Deathstroke, Savage Hawkman, Team 7, Ravagers -- you see a bunch of books with interesting concepts, none of which necessarily lived up to their potential, and all cancelled. Of these, given Deathstroke's popularity on the Arrow TV series, my bet would be Deathstroke is the most likely title to be revived. Give Deathstroke to Matt Kindt or Brian Azzarello, I'd be curious to see what happens. Deathstroke Vol. 2: Lobo Hunt ultimately offered less crazy goodness than I expected; there's hints here of what a Deathstroke series could be, but nothing that really distinguishes itself. "The _Dreaded_ Deadborn," no less. "...the 'Hawkman: Wanted' crossover turned out pretty well in terms of how you think a Hawkman/Green Arrow/Deathstroke crossover spearheaded by Rob Liefeld might." I love this review. I don't like Rob Liefeld's work per say, but I kind of appreciate that he just does his thing and seems to really have fun doing it, so it makes me sad that hear that he's really toned-down in this volume.